How popular is the baby name Danielle in the United States right now? How popular was it historically? Find out using the graph below! Plus, check out all the blog posts that mention the name Danielle. Topanga was the name of a character on the coming-of-age sitcom Boy Meets World, which premiered in September of 1993. The “Boy” at the center of the show was Cory Matthews, his love interest throughout the series was Topanga Lawrence (played by Danielle Fishel). According to Fishel, show producer Michael Jacobs was the one who came up with her character’s name. He was driving down a highway in California when he got a phone call about naming the character. At that moment, he happened to be driving past the Topanga Canyon exit, so he said “Topanga” and it stuck. The canyon’s modern name comes from the Gabrielino (or Tongva) word topa’nga. The “-nga” suffix indicates that it’s a place name, but the meaning of topa remains unknown. Another name that may have gotten a boost from Boy Meets World is Morgan, the name of Cory’s little sister. It was already on the rise at that time, but from 1993 to 1994 the increase was higher than expected. Which place name works better as a baby name, do you think: Topanga or Cohutta? 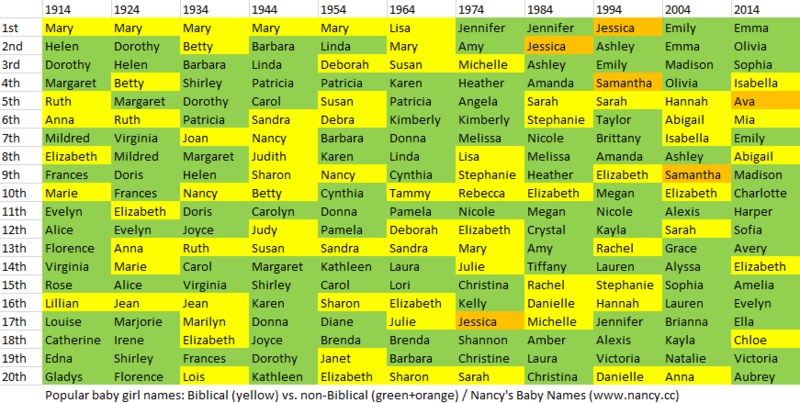 Which one makes a better baby name? Gudde, Erwin G. California Place Names: The Origin and Etymology of Current Geographical Names. 4th ed. Berkeley: University of California Press, 1998. Mooney, James. Myths of the Cherokee. New York: Dover, 1995. African-American model Donyale Luna, who in 1966 became the first black model to appear on the cover of Vogue (the British version). What do you think of the name Donyale? “The Luna Year.” Time 1 Apr. 1966.